PEMBA, Southern Zambia, Apr 22 2016 (IPS) - In scorching heat, Ellen Kacha, inspects her almost failed maize crop, which now looks promising after a rare occurrence this season — normal rainfall for at least two weeks. Droughts have been a common feature in recent years. This El Nino-induced phenomenon that is sweeping across southern Africa this year seems to have worsened smallholders’ problems. Ellen’s smallholding is no exception. “The drought spell this year is worse as compared to the last three seasons. Regardless of conservation technologies that I have adopted, I have not been spared”, says the 56 year farmer of Pemba district. Ellen has been practicing conservation agriculture since 2003. Ellen says she learnt resilient agricultural technologies the hard way, “providing for children as a single mother for 23 years. 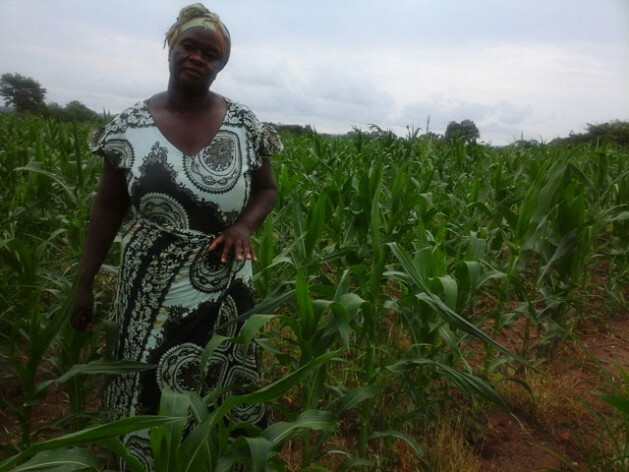 At that time, my soils had become completely useless due to erosion, so I continued seeking for better methods to sustain my family and my introduction to conservation farming was timely”, she explains. According to available statistics, 78 per cent of women in Zambia engage in agriculture, contributing a significant percentage to the country’s agricultural output. This output supports 70 per cent of the country’s 13 million plus population. . However, women remain marginalised in terms of access to credit and most importantly, land. While the former is blamed on financial exclusion, the latter is a product of patriarchal customary land ownership where women are largely excluded from owning land except through their husbands. Customary land is held and used in accordance with customs and traditions of local communities, without any documentation, further complicating matters for women to obtain credit and other required support for smallholder agricultural development. “What I have seen in the region is that women are usually at the centre of coping with disasters but are neglected in long-term planning for resilient projects. Poor access to land and other incentives is a serious stumbling block to their progress. This should change for women know better on how to cope”, says Juliane Ineichen, deputy regional director of the Swiss Agency for Development and Cooperation, the financiers of the World Food Programme’s (WFP) rural resilience initiative — R4 — being implemented in Zambia’s southern province. R4 is targeting the challenge of credit for smallholders, using an integrated approach to risk management, covering credit, insurance and savings. Riding on the existing Food and Agriculture Organisation of the United Nations-led conservation agriculture scaling-up platform, this initiative is also improving early warning systems through automated weather stations and index insurance, which according to WFP Zambia, would almost ‘complete the climate-smart agriculture technology package’. Although not part of the R4 project, Ellen Kacha is a living example of what women empowerment can achieve. “I have no regrets at all. As you can see, I have built two iron roofed houses through conservation. I have educated my children up to university level and just recently bought a 5,000 litres water tank and diesel pump machine for irrigation”, she elaborated. Highlighting the importance of conservation farming (climate smart agriculture) in drought situations, Ellen harvested 778 fifty kg bags of maize last farming season, when most farmers suffered crop failure due to erratic rainfall. Selling 650 of it, Ellen earned herself over 48,000 Zambian Kwacha (US $4,800) from which she bought irrigation equipment. A few kilometers away from Ellen’s farmstead, is Malungo Maina Chabota, 43, also bursting with hope. Through R4 project support, Chabota has learnt crop diversification and is expecting a bumper harvest of cowpeas, in a season characterised by drought. With her cowpeas already guaranteed a market under WFP’s school feeding programme, she has no worries of her children’s school fees. ”This programme is the best thing to have happened to us, especially credit. We don’t have to wait for government inputs anymore, we have the choice to get what we want through the credit scheme under the project”, boasts Chabota, adding that until now, she never thought crop fields could also be insured against erratic rainfall. With such success stories, conservation agriculture has been gaining momentum in the smallholder farming community who see the practice as guaranteed insurance against droughts. However, the El Nino-induced, unusually long drought this season has reminded conservation farming practitioners that there is still more to be done to complete the cycle of climate smart agriculture. “Farmers have been coping with three weeks to four weeks dry spells, but six weeks without rain is too much for the crops to survive”, observes Hosea Njovu, an extension officer under the conservation farming unit, an autonomous non-governmental entity promoting conservation agriculture for improved yields. Njovu says conservation farming is working wonders, but stresses the need to scale up irrigation, a view shared by Ellen, who is only irrigating one hectare in close proximity to the equipment because connecting distant fields comes at an extra cost, which she cannot afford for now. “Just like the farmer input support subsidy programme, we implore government to up-scale irrigation scheme loans for us. We know there are some schemes already but I think they are not meeting the demand and pockets of smallholders, especially women”, she told IPS. Ng’onga further adds that the project is paying special attention to gender to avoid bias towards men as the case tends to be. The colossal sums of money involved to support this kind of technology has been a subject of debate at various climate change conferences including the 2015 COP 21 where world leaders reached a landmark agreement after years of procrastination. The need to up-scale climate smart agriculture has long been recognised at the highest level of African leadership as highlighted by African Union’s New Partnership for Africa’s Development (NEPAD) agency’s strategic focus.